Located outside of the dishwasher, on the right hand side beneath the overflow shield is an external scrap tank, which will catch debris that is washed out during the final rinse. The dishes and utensils should be sprayed off after pre-scrapping is completed and before the rack is placed into the dishwasher. Remember, the better you pre-rinse, the better the wash results will be. The main drain for the wash tank and the scrap tank are both joined together, before they are connected to the building's main drain line. The use of a rubber connection boot is strongly recommended, along with two hose clamps, as seen here. Inside the wash tank is the heater element that runs the length of the tank, and just next to it, at the front of the tank, is the thermostat capillary and float switch. The thermostat control is located behind the front cover, just like the booster heater. The wash tank temperature should be set between 155 and 160 degrees Fahrenheit, while the booster heater should be set between 180 and 195 degrees Fahrenheit. The 1 hp wash pump is located at the bottom of the dishwasher and easily accessible for service. The motor is held in place with two main bolts to stabilize the motor and the wash pump intake. This will help stop possible leaking by the pump's intake and compression nut, with a heavy O-ring and slip ring used to prevent the compression nut from scraping the O-ring. Although the machine may be a single phase or three phase, the wash pump will always be a single phase motor. These very reliable wash pumps and motors are standard throughout the entire line of CMA's upright dishwashers and you can wire it for 220V, as shown in the model CMA 180 series here, or 110V, as seen in all of the CMA 180 series upright low temperature dishwashers. Starting at the front of the pump, remove the three bolts and one stud holding the wash pump housing to the pump base. The housing is sometimes also referred to as a snail, because of the shape. Now you can see the impeller. Remove the round cap on the back of the motor, which is covering the motor's drive shaft. Using a heavy flat or blade screwdriver, unscrew the impeller by turning it counterclockwise to prevent the motor from turning. CMA also has special removal tools available, one that can be used in the field, and one that can be used in the shop, and can be mounted to a bench. CMA also has a special removal tool available that can be used in the field. Once the impeller has been removed, You must then remove the spring, and then the graphite section of the pump kit. Then, remove the pump base to make removing the rear-facing ceramic seal section of the pump seal kit easier. To install the new pump seal kit, first re-install the pump base onto the pump motor. Then, using the food-grade silicone grease shown here, put the grease on both the motor shaft and the lower, rear-facing ceramic seal. CMA prefers this lubricant, part number 00206.35, that is available in small pillows which can cover one or two pumps. The rubber portion of the rear-facing ceramic seal goes on the pump base, where the white ceramic portion faces the graphite front portion of the seal kit. There is no special tool required to install the rear seal, however an old drain ball shaft, or piece of PVC that will fit over the motor shaft will work just fine. Then, the spring is installed before re-installing the impeller onto the motor shaft. Remember that the impeller is installed by turning it clockwise, to tighten it onto the shaft. The wash pump will always be turned clockwise, keeping the impeller tight on the motor shaft at all times. 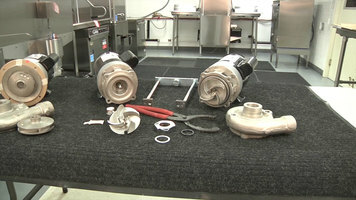 Since the wash pump assembly was dismantled, it will now need to be re-assembled. If you forgot how to install the pump seal kit, remember that it is packaged in the same order that it should be installed. Again, you should use the food-grade silicone lubricant to install the pump seals. This lubricant is also used when servicing other types of food equipment, such as ice cream machines. The pump seal lubricant is available from CMA in small field-use packaging. Use the CMA impeller removal tool when disassembling the wash pump. You will notice in the text below this part number, along with the part numbers for all of the pump components. The water inlet assembly is made up of a ball valve with a built-in line strainer. The new CMA-180T, or tall, is available in both a straight and corner configuration, and functions with the high-performance standards expected from a CMA dishwasher. However, this model only requires 93 1/2" of clearance to open the new split doors, instead of the previous 100" clearance required to open the original doors. Here, we have CMA's newest model, the CMA-180-VL, built with a new ventless option. The ventless option allows the dishwasher to perform excellently, using ambient cold water during its operation, resulting in clean, sparkling, and sanitized dishware and utensils. It will both a hot and cold water supply, however the hot water is only used to fill the dishwasher's wash tank and to flush or clean out the heat exchanger condenser. Hot water is supplied to both the water inlet valve that supplies the dishwasher's wash tank, and to the cleaning system for the heat exchanger condenser. The cold or ambient water is supplied directly to the inlet of the heat exchanger condenser at the top, while the water moves down through the condenser coils while the heat and steam rise. The steam condenses into water, and because it cannot be used, is discharged directly to the drain. The heat exchanger is now converting the ambient, or cold water, from 45 - 70 degrees Fahrenheit to 135 - 145 degrees Fahrenheit, to be supplied to the booster heater that will provide a 40 degree rise in temperature in 90 seconds. The total cycle time is 90 seconds, of which just 30 seconds is the steam evacuation time. 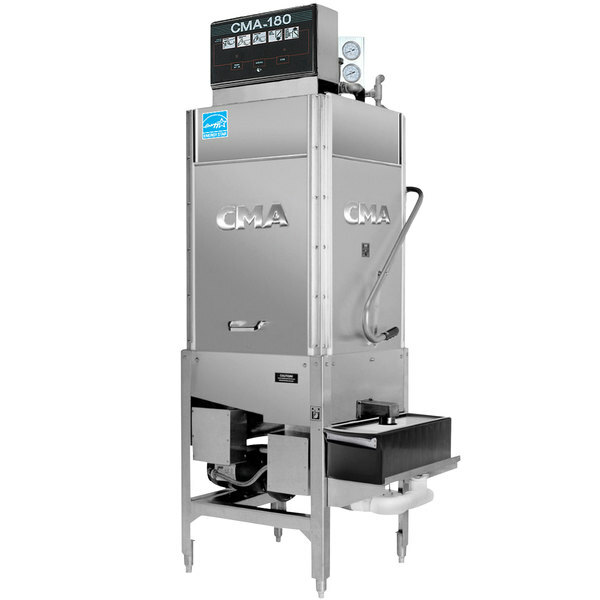 The model CMA-180-VL, with the ventless option, comes in a three door configuration so it can be used as a straight pass-through, or a corner dishwasher. When the cycle light it lit, the doors can be raised, and a rack of dishes can be placed into the dishwasher. When the doors are lowered the cycle will begin. When the cycle light turns off, the rack can be removed, and another rack can be moved immediately into the dishwasher to start the next cycle, with the steam and heat passing through the heat exchange. The booster will consistently receive that 135 - 140 degree water - this is required to maintain the 180 degree plus water, while performing a 40 degree rise in water temperature in 90 seconds. The hot water valve is located at the top of the dishwasher, behind the control box and just in front of the condenser, with its own ball valve with a built-in line strainer to keep debris out of the dishwasher's plumbing system. Just past the water valve is the final rinse manifold for the chemical supplier's rinse injector for the rinse aid. The cold water valve, with its built-in line strainer, is located at the bottom of the dishwasher, with access from the front, as well as the left-hand side. The cold water valve supplies the condenser water which is then heated to 135 - 140 degrees Fahrenheit before feeding it to the booster heater. Now, let's look at the CMA 180 series installation check list. Check to make sure that your new dishwasher is level, after it was set in place. Check all electrical connections to ensure they are tight and secure. Check all water, drain, and plumbing connections for leaks; tighten if necessary. Check all wash arms to make sure they are installed correctly. Check final rinse arms to make sure they are installed correctly. Check that the wash tank temperature is a minimum of 155 degrees Fahrenheit. Check that the final rinse temperature is 180 - 195 degrees Fahrenheit. Check that the final rinse pressure is 20 PSI, plus or minus 5 PSI. Read all labeling and follow the instructions. Review the installation section before installing the model CMA 180 upright series dishwashers. All procedures and guidelines should be followed during installation. This concludes our installation and service training video. 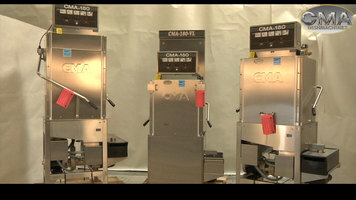 CMA dish machines - always delivering peace of mind. This video gives an overview on the features of the CMA 180 series dishwashers, with a focus on the CMA-180-VL ventless unit. It also covers some maintenance and usage tips, like how to repair a wash pump! This instructional video will be covering the model CMA 180 series upright high temperature dishwashers. Also included in this series are CMA's two most recent designs—the new model 180-VL with the ventless design option and model CMA 180T, also referred to as a tall or scullery machine with the new split door design. Sometimes, the 180T has even been called a bakery-style dishwasher for its ability to wash a full size sheet pan due to the machine's extra high clearance. All dishwashers described so far are available in straight and corner configurations. This video will be focusing on the installation and service of these high temperature dishwashers. Here we have our model CMA 180 series dishwashers. These units require a 140 degree water supply through two water inlet valves. One is for the initial fill valve and the other is for the fresh water high temperature final rinse. All units will require a 2" drain line, which can be directed to either the building's plumbing directly or to a floor drain or floor sink if one is located near the dishwasher. These units are typically ordered with a booster heater built right into the framework or footprint of the dishwasher. This booster heater will be pre-mounted and plumbed directly into the final rinse plumbing. These models can be ordered without a booster heater. However, its installation will be required to run these machines as high temperature dishwashers. In the event that the unit is ordered without a booster heater and you find one is required, it can be ordered as an add-on kit installed in the field. The power requirements for all model 180 series dishwashers are 208V-240V single phase or 3 phase, and they can be installed with a single or dual power source. These models can also be special ordered as a 380V or 480V dishwasher, though at the time of your order, it must be specified as a 50 or 60 Hz unit. At the top of each dishwasher is the control box where all electrical connections are made. This also includes the connections for the chemical dispensers, detergent, and rinse aid. In the back of the control box, which is located on the left hand side near the bottom, is the conduit connection for the main power wires. Pass through to the main terminals L1, L3 for single phase installation, and the L2 terminal which is used for 3 phase installation. Please remember that if the location has a high leg or wild leg, it must be connected to the L2 terminal in all 3 phase applications. Located at the top of the terminals are the dispenser terminals for the detergent and rinse aid signals. Red for detergent and blue for rinse aid. The main power can be picked up on terminals L1 and L3 for the main contactor, so the dispenser will be powered up when the dishwasher power is turned on. Located on the back wall of the control box on the right hand side is the blue solid state timer that controls the auto-fill feature of the dishwasher. This may have to be adjusted during installation if the machine is being installed with extremely high or low water pressure. This unit has two available options that can be ordered from the factory, which can be installed in the field for units that are already in service. First, is the exhaust fan control. This option is used to control the activation and deactivation of the exhaust fan, which, during installation, is placed over the dishwasher in most facility locations. Also, this unit may also require a drain tempering kit to quench or cool down the water being discharged from the machine during the rinse cycle. The dishwasher has two water valves. One for the auto-fill feature of the dishwasher located directly behind the main control box at almost the center of the dishwasher, and the final rinse valve located at the rear left hand corner of the dishwasher. Both valves are fed by one ball valve with a built-in line strainer to keep debris out of the dishwasher plumbing system. The final rinse is water supplied directly to the booster before entering the final rinse arms through a pressure regulator valve, or PRV. The final rinse pressure should be 20 PSI +/- 5 PSI. However, for best results, we found the most optimum pressure to be 22-23 PSI. The gauge will only display the pressure when the final rinse is active. Located inside the control box at the top of the dishwasher is the main activation switch, which is labeled: delimer, off, normal. After the machine has been fully installed and filled with water, this switch should be moved to the normal position. Please note, if this switch is not in the normal position, it will not auto start when the doors are lowered. Located at the bottom left hand corner of the control box are two black wires with yellow stripes. These wires are disconnected during shipping, which has been done to prevent the booster heater element from being activated before first being filled with water. Before connecting the two wires and after having the water and power connected to the dishwasher, fill the booster heater with water by way of the manual rinse switch located at the outside bottom right hand rear corner of the control box. Located at the bottom left hand side underneath the wash tank is the booster heater. This unit requires a 140 degree water supply, which results in a 40 degree rise in temperature within 90 seconds and a 70 degree rise in temperature within 2 minutes. By removing the front cover, we will see the element, the hi-limit switch, and the thermostat. The wash tank heater is located on the right hand side of the dishwasher. Behind the cover, we will once again see the element, the hi-limit switch, and the thermostat. Also located behind the machine inside each cover, you'll find the configuration for the unit's single phase or 3 phase conversion. The temperature gauges are located at the top of the dishwasher just behind and to the right of the control box. Please remember that the wash tank temperature will be displayed at all times. However, the final rinse temperature and the pressure will only be displayed during the machine's active operation. Keep in mind that all of the model CMA 180 series machines, including the model 180UC undercounter dishwasher, include the new safety temp feature. This feature assures that the final rinse cycle will operate with the booster heater being at the set point, or at the appropriate temperature for a high temperature sanitizing final rinse, which is required to complete a wash cycle. Both wash and rinse arms are located inside the dishwasher's wash cabinet with one set of each located at the top and bottom of the wash cabinet. Both top and bottom wash and rinse arms are identical and fully interchangeable. They both should be removed and inspected on a daily basis and cleaned if necessary. To clean both arms unscrew and remove the end caps. Clean the jets using a toothpick or soft bristle brush, and always rinse thoroughly with fresh water. If the arms have scale buildup, use a chemical descaler as recommended by your chemical supplier. Remember to read all labels and follow the chemical handling instructions. Or, ask your chemical supplier how to use their chemicals. The wash tank has two removable scrap trays that are located on the bottom right hand side of the wash tank. Inside the wash tank is the heater element that runs the length of the tank. Just next to it at the front of the tank is the thermostat capillary and float switch. The float switch is protected from debris by a guard that allows easy access to clean the switch on a daily basis. At the extreme right side of the wash tank, notice the wash tank's scrap tank overflow. When the dishwasher is in the rinse cycle, the rinse water will carry all debris out of the dishwasher, which may have been missed when pre-scrapping the dishes before placing them into the dish rack. This will keep the wash water clean and free of debris and the screens in the tank will keep the heavier debris out of the wash pump. To prevent any debris from getting into the wash pump remember to rinse the wash tank before removing the scrap screens. Remember, the better you pre-rinse, the better the wash results will be. CMA dish machines—always delivering peace of mind. This video presents step-by-step instructions for installing your CMA 180 series dishwasher, and even goes over additional requirements you will need such as a 2" drain line. Check it out to learn more! Wash Tank Capacity 8 gal. The CMA-180TSB single rack high temperature straight tall dishwasher is perfect for both glassware and dishware, and has a 27" high door opening to accommodate larger items. Its "split" design accommodates sheet pans, and reduces the overall open-door height of the machine to 93 1/2", a benefit for dish rooms with low ceilings! With a 1 minute wash cycle and 1 hp wash pump, the CMA-180TSB straight tall dishwasher can clean up to 60 standard dish racks per hour. The CMA-180TSB dishwasher only uses 1.24 gallons of water per cycle, which makes it economical to operate and friendly to the environment. Upper and lower rotating wash and rinse arms provide excellent cleaning. Specially designed pull-pins allow the wash arms to be easily removed for cleaning. A built-in 12 kW, 40 degree rise booster heater ensures a continuous supply of 180 degree Fahrenheit water during the rinse cycle for proper sanitization. The CMA-180TSB single rack high temperature dishwasher incorporates an automatic soil purging system which traps plate debris in a removable external drawer, keeping the wash water clean. 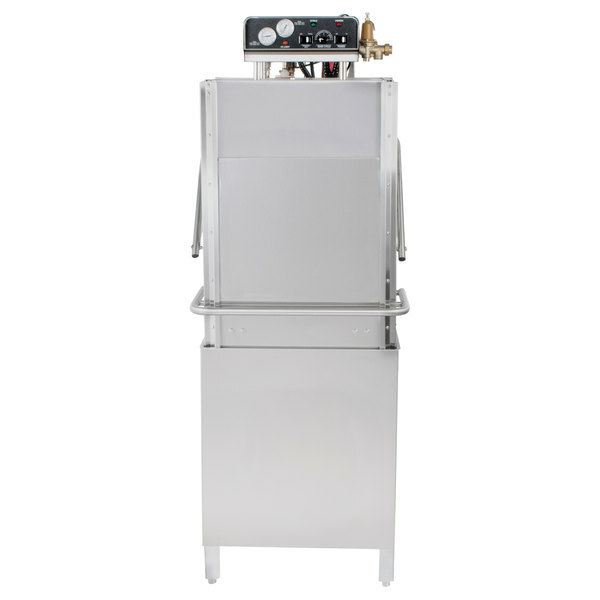 Other helpful features of the CMA-180TSB high temperature straight tall dishwasher include a water pressure regulator valve and a water tight top mounted control box with a rack counter, extended delimer switch, and easy to read controls. It requires a 208/240V, 1 phase electrical connection. Save $950.00 with our Recommended Product! Check out the Noble Warewashing HT-180HH dishwasher instead! This high temperature machine features a built-in water pressure regulator and gauge, as well as top-mounted controls for easy operation. It's a comparable dishwasher at a more affordable price! Booster Tank Capacity 3 gal.